Would You Like to Join Garrett Law Group’s Free VIP Program? Become a Free Member Today and Get Instant Access to All Member Benefits! *Members are Instantly Added to All Garrett Law Group’s Contests and Drawings! Become a VIP Member for FREE! Garrett Law Group is proud to announce the launch of our exclusive Free VIP program. VIP members are given special privileges and access to legal services, as well as entry into regular Garrett Law Group contests and giveaways. No more long lines or silly fees at the bank. We will notarize your documents free at our Tulsa, Oklahoma office. Contact us ahead of time to make ensure our notary is available. If you’re injured, will your insurance cover you? What if someone hits your vehicle and they are driving without insurance? Will your coverage be able to pay your medical bills, time missed at work, and other accident expenses? Call to make an appointment with either Logan Jones or Eric Brown, gather up your insurance documents, and they will personally sit down with you and review your policy. Sometimes all someone needs to do is chat with a lawyer about their situation. Since we are a personal injury firm, our specialty is answering questions about auto accidents and getting hurt on the job. You can always come to us about your situation, and if we can’t personally help, we are going to help you find someone who can. What can we help you with? How about –Personal Injury Law, Criminal Law, Bankruptcy Law, Immigration Law, Social Security and Disability, Family Law, Medical Malpractice and Mass Torts, Employment Law, Veterans Benefits, Civil Rights Law, Expungement, and Estate Planning: Wills and Trusts. No more calling one of those “lawyer referral companies” and getting a random anonymous lawyer. If it’s not a legal matter we handle, we will refer you to an experienced attorney who can help you. Garrett Law Group has a giveaway almost every month, and as a VIP member, you are automatically entered for each contest and giveaway. Good luck! 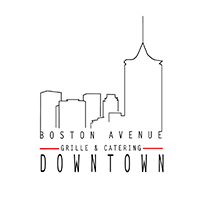 Garrett Law Group is proud to partner with some Downtown Tulsa Businesses in order to give you, our VIP Members a chance at some great prizes and gifts. CHEF JUSTIN THOMPSON IS KNOWN FOR HIS EXCEPTIONAL AWARD-WINNING DINING CONCEPTS THROUGHOUT DOWNTOWN TULSA. 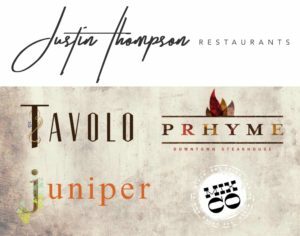 JUSTIN HAS BEEN RECOGNIZED BY TULSA PEOPLE MAGAZINE, THE TULSA VOICE, AND OKLAHOMA MAGAZINE AS BEING ONE OF TULSA’S BEST CHEFS. Justin is passionate about giving back to the community and has donated his time and efforts in support of many of Tulsa’s charities, including Alzheimer’s Association, the Child Abuse Network, Chefs for the Cure, Cooking for a Cause, Chef Fest, Sip for Sight, Cooking Up Compassion, March of Dimes Gourmet Gala, Meals on Wheels, Uncorking the Cure for MS, Juvenile Diabetes Research Foundation, RAIN Oklahoma, Bella Cucina, and Philbrook Museum.’ This chef began his culinary career in 2002 as a sous chef at the Polo Grill, and in 2014 he is a culinary veteran with five successful restaurants Juniper, PHRYME, Tavolo, MixCo and 624 Kitchen and Catering. We serve a wide range of food from Hand-tossed salads as well as our ‘From the Border’ options, hand-rolled burritos, freshly toasted quesadillas, specialty sandwiches like the Cuban, turkey and guacamole and our signature chicken salad – all made-to-order! Our full breakfast menu includes favorites like burritos, breakfast sandwiches, hand-rolled sausage rolls, home-made quiche and freshly baked muffins.